Ludwig Börne was the son of the Jewish banker Jacob Baruch. When he was educated by the famous physician Marcus Herz he fell in love with his wife Henriette. He wrote her a string of letters, but she didn't answer his love. Howeverm they kept good relations. After Marcus Herz died in 1803 he went to Halle to study medicine. When the University of Halle was closed in 1806 he moved to Heidelberg. Because of debts he was sent to Giessen in 1808 by his father. There he took his doctor's degree in law and political science. In 1811 he was appointed policy actuary in Frankfurt am Main, but after the fall of Napoleon in 1814 he was forced to resign because he was a Jew. He became a journalist and edited several newspapers. In 1818 he converted to protestantism and changed his name to Ludwig Börne. From 1818 until 1821 he edited the political and satirical paper Die Wage. After that paper was forbidden he went to Paris, where he worked for Cotta von Cottendorf as correspondent for "Morgenblatt". In 1822 he returned to Heidelberg, where he lived in poor circumstances until his father died in 1827. In 1830 he returned to Paris to see if the revolution there corresponded with his idea of freedom. This was not the case. From Paris he published satirical letters on Germany in a new paper, "La Balance". This to the great anger of Heinrich Heine, who critisized him severely. Börne died in Paris in 1837. 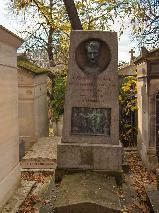 The grave of Ludwig Börne at Père Lachaise, Paris.